As a professional audio recording and editing software for Mac OS, Boilsoft Audio Recorder for Mac can record sound from Mic, CD player, line-in devices and other applications (like Skype, QuickTime Player, RealPlayer, iTunes, VLC, or DVD Player) into any popular audio format including MP3, WAV, AIFF, AAC, AC3, AU, FLAC, M4A, M4R, MATROSK and OGG. 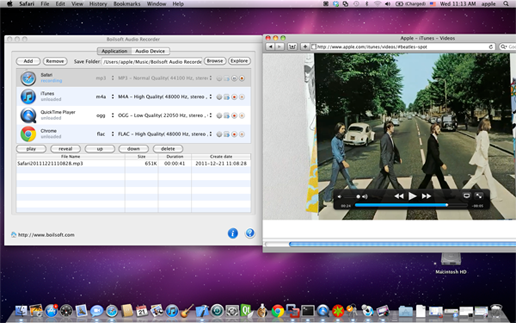 It can also enable you to edit audio file or recordings and supports recording audio in batch. Converts protected WMA to all audio formats at high converting speed!Main Features:- convert DRM protected wma files- converting in one click!- high speed;- setting resulting format options;- drag and drop support;- editor of tags. Any DVD Clone is a powerful and easy-to-use DVD movie decrypter and copier software tool for cloning any non-protected or copy-protected DVD movies to DVD or computer hard drive.